No one individual can replace Bernie Ecclestone at the helm of Formula 1, and teams must start planning for a very different future after the 83-year-old eventually leaves the stage, Ferrari president Luca di Montezemolo has said. The Italian, who has been in the sport since the mid-1970s, wants to invite Team Principals to a meeting at Ferrari’s Maranello factory in January to discuss where F1 is heading and what should be done. “We are arriving a little bit at the end of a very, very important cycle and era of Formula 1,” the 66-year-old told reporters over a Christmas lunch at Ferrari’s Fiorano test track where the team’s late founder Enzo spent much of his time. Ecclestone is facing a series of legal battles linked to a deal that brought private equity firm CVC on board as the largest shareholder eight years ago. The billionaire Briton has no plans to stand down but what happens if he is no longer capable of running the sport or dies is an unanswered question that is becoming increasingly asked. Ecclestone runs the commercial side of the $1 billion sport very much as a fiefdom, with no designated successor and an unwillingness to delegate. Montezemolo raised the possibility of teams, contracted until 2020, one day setting up their own company and repeated a familiar warning that Ferrari could leave if Formula 1′s owners used the sport solely to make money. 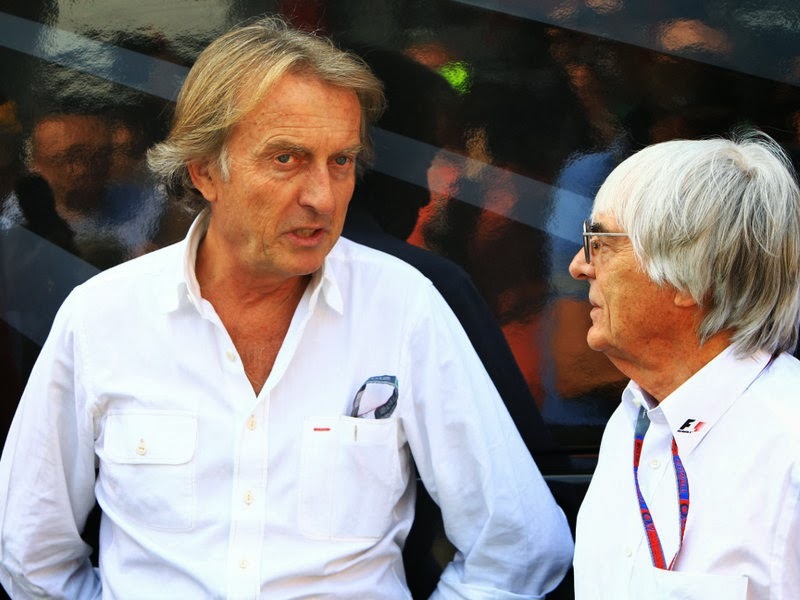 Montezemolo said that while the Briton was “for many reasons not in the best moment of his life” he would not be the one to take advantage of those difficulties and indeed hoped Ecclestone would be around for some time to come. “While Bernie is here, Bernie knows and Bernie is intelligent,” he said. “Sometimes he is too conservative but he’s Bernie. Ecclestone recently pointed to Red Bull principal Christian Horner, who is only 40 years old, as a possible successor but Montezemolo said that was out of the question. “We need managers, we need people that know the money, that know television, the marketing, a lot of things,” he said. Montezemolo said that the teams, who tend to focus most of their attention on immediate priorities, needed to step back and take a long-term view. “I am in favour of doing a company fully owned by the teams…but this will be in the future. Today we have a contract with CVC until 2020,” he said. Asked whether he planned also to invite CVC to Maranello, Montezemolo hoped a separate meeting could take place but made clear that he did not see them as long-term players. “I think CVC is good for today but I don’t think the future of Formula 1 will be with CVC because they want sooner or later to sell,” he explained, adding that the value of their investment would in any case be “not so big” after 2020.